When we exercise, our body uses two main fuel sources. These are carbohydrate and fat. Our bodies contain a store of both carbohydrate and fat to be used as an energy source for simple day to day movement, as well as exercise. The dominant fuel we use during exercise will depend on both the duration and the intensity of the exercise. Carbohydrate is an easy to burn fuel, which means the body can convert carbohydrate (or glucose) molecules into an energy source very quickly and efficiently. In comparison, fat is an inefficient fuel source. It is much harder for the body to convert a fat molecule into energy. The body actually has to use some energy to make the energy from a fat cell, therefore producing less energy for the body overall. Light exercise, such as walking, does not put the body in desperate need of an immediate or large fuel source. 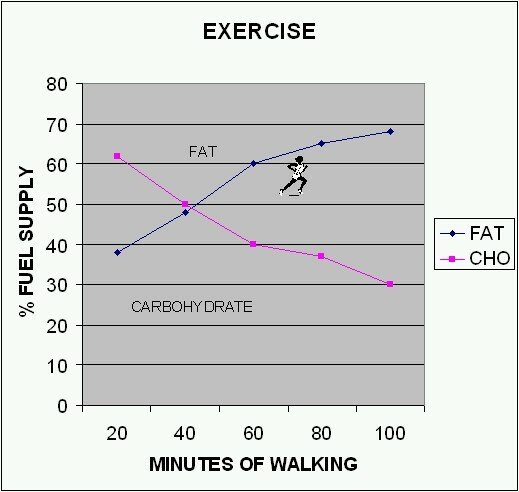 For this reason, light exercise will more likely rely on an inefficient fuel source, such as fat. Once an exercise routine becomes more vigorous and more intense, the body will need to convert to a more efficient fuel source that will provide more energy quickly. Such an energy source is carbohydrate, or glucose. The truth is that the body will actually always rely on both fuel sources, however the percentages may change. For example, if you were at rest and then immediately began to jog, your body would need to supply you with energy to do so. 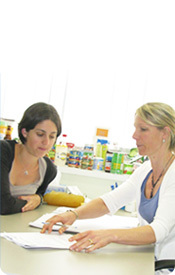 In this situation the body would draw upon more carbohydrates, approx 70 percent, and less fat, approx 30 percent. If you were to continue jogging, for a longer period the body would try to preserve your carbohydrate stores so would gradually shift to burning approx 40 percent carbohydrates and 60 percent fat. The fitter we are, the sooner we shift form burning more carbohydrate, to more fat. The diagram below shows at what stage you convert to a greater fat burning percentage. This highlights the benefit of longer more intense exercise. Whether you are burning carbohydrate or fat, you are always burning kilojoules, and it is the overall burning of kilojoules that will lead to weight loss. It is just as the old saying goes, `kilojoules out should be greater than kilojoules in for weight loss´. The longer and harder the exercise session, the more kilojoules you will burn overall, despite whether they come from fat or carbohydrate, and therefore the more weight you will ultimately lose. So if you're trying to lose weight and you have only 30 minutes to work out, you would burn fewer calories walking at a moderate pace compared to walking at a fast pace. Even though the higher intensity fast walk may cause you to burn a lower percentage of fat, you burn a greater number of kilojoules overall. The important thing to remember is that we will start to burn kilojoules immediately upon exercise, so any amount or intensity of exercise is beneficial for weight loss. In addition, the more tired you are after an exercise session, the harder your body must work to recover from the exercise. This will require your body to continue burning kilojoules post exercise, during the recovery phase.